Shirts With Random Triangles: Ole Miss QB Chad Kelly Posts Video Of His Throwing A 70-plus Yard Bomb Into The End Zone. 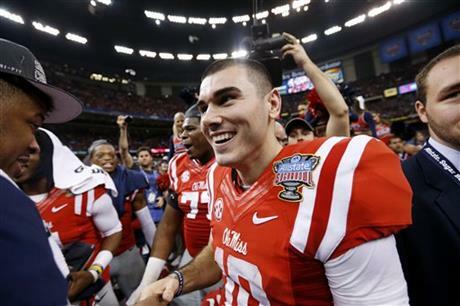 Ole Miss QB Chad Kelly Posts Video Of His Throwing A 70-plus Yard Bomb Into The End Zone. Chad Kelly. Image via AP. Ole Miss supporters are probably still feeling the pain over the release of the NCAA's notice of allegations to the school on Friday. So to cheer you up this is a video Ole Miss starting quarterback Chad Kelly posted to his Instagram account throwing a 70+yd bomb down the field into the end zone. Hopefully Ole Miss self-imposed violations will be enough to keep the NCAA from banhammering the school into a postseason ban pulp. Don't hold your breath.